In the past, a book, a wooden cane, a ruler, anything within reach was used to punish students at the school. “Parents gave us permission to beat their children,” said Mr Mork Koy, who has been teaching for more than 30 years. ‘One mother said to me, “do what you need to do, just spare his blood and bones,”’ he added as he explained the culture of discipline in the school three years ago. He admitted that pupils received various kinds of verbal and physical forms of punishment either for poor behaviour or to deter students from breaking the rules. The ruler was a convenient tool used to hit children in Peam Ror School. the ruler is reserved for more conventional uses during maths lessons. A decline in student attendance and poor grades were warning signs that they were not enjoying their school experience. Parents were reluctant to keep sending their children to school after persistent absence led to poor grades. 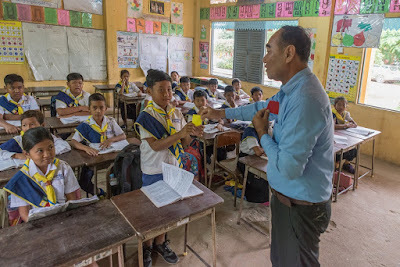 School director, Mr Keo Saren, was determined to explore new ways of turning things around. He was approached by the Ministry of Education, Youth and Sports (MoEYS) to enrol teachers in a pilot training programme on positive discipline funded by UNICEF. Mr Saren, though sceptical, saw it as an opportunity worth exploring. The 4-day training is an intensive course that has proven to transform even the most seasoned and experienced of teachers. At Peam Ror, teachers admit to changed views and a commitment to teaching without using violence against children in school. “I beat a child with a book, I hit him so hard he started to throw up,” Mr Koy confessed as he described his experience of discipline in the classroom. “If a child stepped out of line, I was quick to hit him. Now I feel so bad thinking about it, I’m ashamed about how I used to treat my students,” he says, convinced violent discipline is not in the best interest of his students. 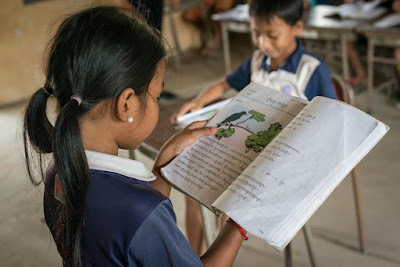 A student at Peam Ror School reads aloud to her classmates. Anger management skills were part of the training the teachers received. “I’ve been teaching for many years, and I would never have agreed that positive discipline methods work, but it has helped me become a better teacher. “I must model the behaviour I want to see in my students. So instead of hitting them when I’m annoyed or frustrated by their behaviour, I must remain in control,’’ Mr Mork Koy explained. “Once, a parent reported that their child had returned home bleeding with his earlobe cut because a teacher had pulled it hard,” said school director, Mr Saren. “When students misbehave, they would be given all sorts of corporal punishment, like standing on one leg with their arms raised for extended periods of time,” he added. Now, a new approach to discipline is in practice in the school. School rules are explained clearly to the students and they are given the opportunity to discuss them. Students are involved in the process of developing their class rules with their teachers. Every student understands the consequences for disobedience and agrees to follow the rules. Things have changed as a result of the positive discipline process. A child who misbehaves is given a “yellow card” as a verbal warning by the teacher. If the situation persists, they are given another card, and are separated from their peers. If needed, the situation is escalated to a “red card” and the child is sent to the school director’s office where a more formal process of discipline starts, involving the disciplinary committee. The disciplinary committee is made up of three representatives of the student council and eight members of the school staff including Mr Mork Koy who chairs the council and Mr Keo Saren. Serious disciplinary cases are discussed with members of the CCWC (Commune Council for Women and Children) which promotes and protects the rights of women and children in the community. Sokha Long (12) is on the student council and one of the top performing students with good grades, but she wasn’t spared from the sting of the cane either. “I used to get in trouble at school for not paying attention to the teacher and for playing during the lesson. I would get hit by the teacher for this. It made me feel really bad, and when my classmates got hit too, I would feel sorry for them,” Sokha recalls. “I find it much easier to talk to my teacher now. When I don’t understand numeracy, I’m not afraid to ask questions. I like the way my teacher speaks gently to me and helps me understand. I feel braver to talk to her. I know she will not hit me,” She added. “I’ve seen a big transformation in the way the school is run. Walking down the corridor along the classrooms, I notice a more positive interaction between teachers and students. No harsh words and no tears. I see that the children enjoy coming to school,” said Ms Jen Siran, the school’s representative to the CCWC and head of the School Support Committee. The School Support Committee is comprised of school staff and members of the community and coordinates events and activities to help improve the learning experience of students in the school. “Now, the drop-out rate in the school is very low. Not only have the students benefited from the training, but the teachers have gained a lot from it too,” Ms Siran added. “It takes everyone to make a change. The teachers, school support committee, parents and the students now have good results from positive discipline. Collectively, we’re enjoying the benefits of positive discipline,” Ms Siran said. 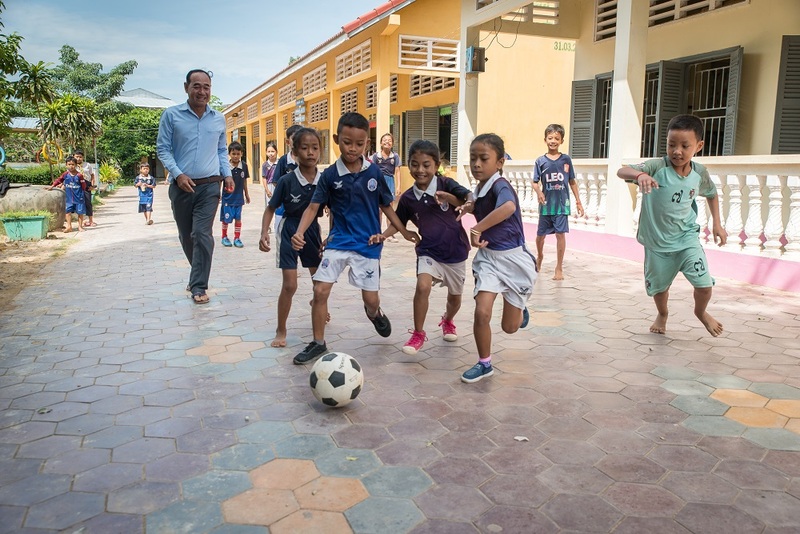 Three years on from the launch of the positive discipline programme, 409 schools, with more than 3,400 teachers of about 120,300 students have taken part in the programme in Cambodia. Thanks to the support of Sida, Primark and USAID, more teachers in Cambodia can take part in the programme and ensure more children experience the benefits of learning in a positive environment.